The latter constraint arises because the surface of the sphere is impenetrable, which implies that at . Because the solutions of Laplace's equation, subject to well-posed boundary conditions, are unique (Riley 1974), we can be sure that the previous axisymmetric solution is the most general solution to the problem. Figure 7.4 show the contours of this stream function. 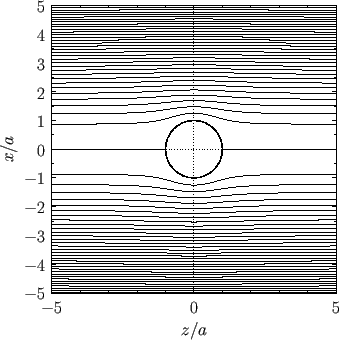 Figure: Contours of the stream function generated by a spherical obstacle of radius placed in the uniform flow field .